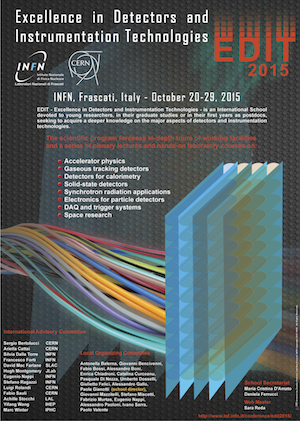 The Excellence in Detectors and Instrumentation Technologies School, EDIT 2015, will be hosted by the Frascati National Laboratory of INFN, Italy, from 20 to 29 October, 2015. EDIT 2015 is the 4th in a series of international school on detector and instrumentation technologies started at CERN in 2011, and followed by Fermilab and KEK editions. The aim of the school is to give to young researchers, in their graduate studies or in their first year as post docs, the possibility to acquire a deeper knowledge on the major aspects of detectors and instrumentation technologies. This goal is achieved by providing a diversified program that integrates topical academic courses with hands-on laboratories. in-depth tours of working facilities. Students will be gathered into 8 groups of 6 students each, 48 students in total. Experts in the fields will support the participants in their learning process by providing continuous guidance as Tutors, experts who prepared the experimental set-ups, and Professors of Excellence, lecturers or experts who will support the students with additional explanations and critical discussions. On Saturday 24 October, it is foreseen to visit the LNGS – Gran Sasso National Laboratory, the largest underground laboratory for experiments in particle physics, particle astrophysics and nuclear astrophysics. provide two letters of reference from the candidate’s professor, PhD advisor or a Senior Physicist colleague. The signed and dated letters of reference – with letterhead of referee’s institution – must be sent to the Secretariat, preferably as an e-mail attachment or by fax. Applications without two reference letters will not be considered. The application dead line is 30 June 2015. The selection of the candidates will be made by the International Advisory Committee and all applicants will be informed whether or not they have been selected within the end of August. There is no registration fee for accepted applicants, but you or your institute will be liable for any other expenses (travel, lodging and meals). A limited amount of money will be available to support students from emerging countries. Please, indicate in the application form whether you would be eligible for some support.